This time the excellent Dutch label gives us lute music of Piccinini, Buxtehude cornett sonatas, and coronation music for Charles II. I. Alessandro Piccinini: Lute Music (Monica Pustilnik, lute). Accent CD ACC 24193. Alessandro Piccinini, a contemporary of Monteverdi and Frescobaldi, hailed from a Bolognese family of lutenists that made its mark on Italian musical life for over one and a half centuries. At the court of Ferrara, Alessandro became familiar with the development of a new kind of lute that would later be designated as the archiliuto. This instrument is notable for its second extended neck to accommodate drone strings and was enthusiastically taken up by contemporaries such as Carlo Gesualdo. After a longer sojourn in Rome, Alessandro Piccinini returned in 1611 to Bologna, where he published his lute works in 1623 after a lengthy preparation. The preface to this (first) volume contains a fundamental introduction to playing the lute and chitarrone; then as now, it was a decisive source for lute technique. After Piccinini' death, his son Leonardo Maria published a second volume with lute pieces by his father in 1639. Stylistically, Piccinini's lute works are influenced by the emergent Italian instrumental music, but French and Spanish influences can also be clearly heard. II. 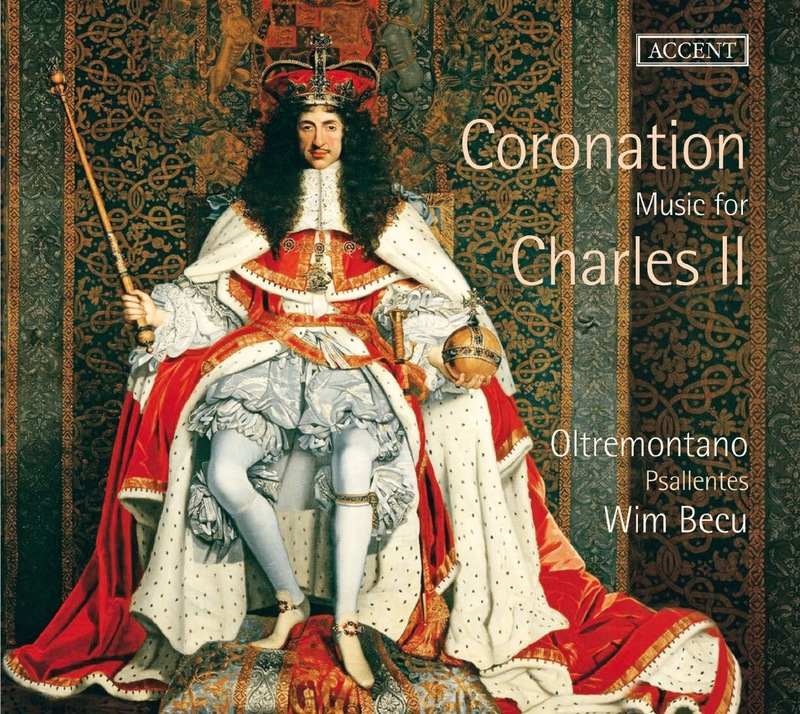 Coronation Music for Charles II (Oltremontano/Psallentes/Wim Becu). Accent CDACC 24300. From Robert Hugill: This latest disc (on the Accent label) from the Belgian cornett and sackbut ensemble Oltremontano, directed by Wim Becu, explores the music written for the coronation of Charles II. Though the group is joined by the choirPsallentes for three items, the disc is very much wind ensemble based and encompasses the music written for Charles's ceremonial entry to London, procession, coronation ceremony and the coronation banquet with music by Robert Parsons, Marin Mersenne, Matthew Locke, Girolamo Fantini, William Child, William Byrd, Pelham Humfrey, Augustine Bassano, William Lawes, John Adson. 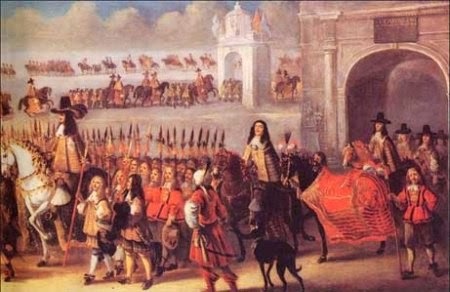 Charles' coronation took place a year after his Restoration in 1660. It probably took the intervening year to organise the grand spectacle (very much based on earlier models), as most things including the Royal Household had to be assembled from scratch including creating new coronation regalia and the training of choirboys. The disc comes with an excellent article by Prof. Dr. Grete Haenen which explains just what we are listening to. Not all the music survives and we do not have record of some, so some of the pieces are putative. We start with period trumpet music, by Robert Parsons and Marin Mersenne for Charles' entry, and then Matthew Lock's 5-part things for the cornetts, a seven movement suite written for performance at one of the triumphal arches that Charles passed through on the procession. 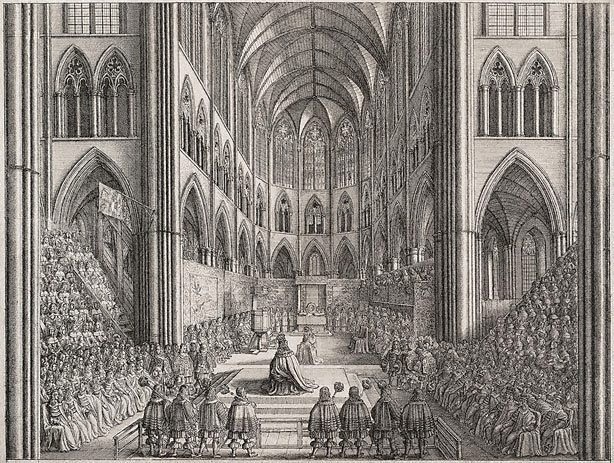 For the coronation itself, the choir was that of Westminster Abbey and the Chapel Royal, and they were joined by the Four and Twenty Violins and the Royal Wind Band. This latter group played with the choir, probably as Grete Haenen points out, colla parte because the raw trebles (with only 12 months training under their belts) needed every help. William Child's anthem O Lord, grant the King a long life was sung during the procession from Westminster Palace to Westminster Abbey. And to represent the music in the service we have two works by Pelham Humfrey, The King Shall Rejoice and Te Deum. Though slighter later, Humfrey had trained at the Chapel Royal as a chorister in the early intake and his style corresponds with the taste of the court though these were were written later (Humfrey was 14 in the year of the coronation). After the coronation came the banquet in Westminster Hall (pre-Queen Victoria, almost more pre-eminent event than the coronation service). The repertoire for this has not survived so we get a representative selection of works from previous generations which were still current. The disc concludes with a suite of music from the pre-war period written by John Adson based on music written for the masques which were an essential part of pre-war court life. The ten voiced choir, joined by organist Bart Rodyns, acquit themselves well and sing the period music with authentically robust vigour, as well as in highly creditable English. But the balance of the disc is on Oltremontano and the wind playing throughout, in all its various forms, is fine indeed. One slightly curious pieces of atmospherics is that for the outdoor scenes, there are short tracks of voices, street-sounds and horses. Not every piece on the disc is great music, much was written for functional use. But the various groups really bring the event to life, and by choosing to represent the whole day we get a lovely variety of music. William Byrd - Borning a 5 "The leaves be green"
III. Dietrich Buxtehude: Sonatas with Cornett (Le Concert Brisé/William Dongois). Accent CD ACC 24291. William Dongois is one of the best known cornett players of our time. He is able to perform the repertoire of his instrument - the cornett resembles a flute in its construction, whereas its wooden mouthpiece is used similarly to that of the trumpet - with dancelike elegance, rhetorical conciseness and, often, even with a certain 'groove'. In the late 16th century, the cornett developed into a highly virtuosic solo instrument, but the gradual decline of the cornett began with the rise of the violin beginning in about 1630. On the present CD, William Dongois has concentrated on works of Dieterich Buxtehude that were actually intended for the 'competing instrument', the violin. Together with Stefan Legée (baroque trombone) and Pierre-Alain Clerc (organ), he has adapted trio sonatas by Dieterich Buxtehude (originally for violin, gamba and continuo) for two winds with concertante organ - a type of arrangement that cannot be historically verified, but is all the more convincing in its sound. These sonatas are supplemented by several original organ works composed by Buxtehude. This composer's oeuvre has only survived to the present day thanks to several manuscripts; with just a few exceptions, astonishingly, it was not published during his lifetime. Dieterich Buxtehude, Alessandro Piccinini, John Adson (c1587-1640), William Lawes (1602-1645), Augustine Bassano (c1526-1604), Pelham Humfrey (1647-1674), William Byrd (c1543-1623), William Child (1606-1697), Girolamo Fantini (1600-1675), Matthew Locke (1621/22-1677), Marin Mersenne (1588-1648) , Robert Parsons (c1535-1571/72) .